This book chapter is adapted from El Khoury in Assessing the benefit of deploying EEE on commercial grade network switches, Unpublished PERCCOM Masters Dissertation, University of Lorraine, Nancy, France, 2017,  and it is closely linked to work published in Kharchenko et al. (eds.) 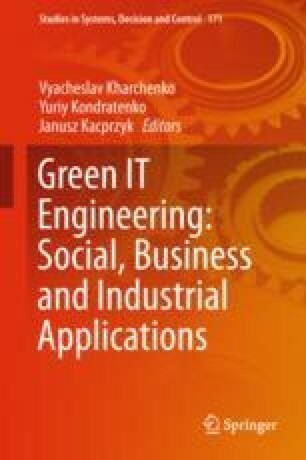 in Green IT engineering: concepts, models, complex systems architectures. Studies in systems, decision and control, vol. 74. Springer, Cham, 2017, , Kharchenko et al. (eds.) in Green IT engineering: components, networks and systems implementation. Studies in systems, decision and control, vol. 105. Springer, Cham, 2017, . Reducing power consumption of network equipment has been both driven by a need to reduce the ecological footprint of the cloud as well as the immense power costs of data centers. As data centers, core networks and consequently, the cloud, constantly increase in size, their power consumption should be mitigated. Ethernet, the most widely used access network still remains the biggest communication technology used in core networks and cloud infrastructures. The Energy-Efficient Ethernet or EEE standard introduced by IEEE in 2010, aims to reduce the power consumption of EEE ports by transitioning Ethernet ports into a low power mode when traffic is not present. As statistics show that the average utilization rate of ethernet links is 5% on desktops and 30% in data centers, the power saving potential of EEE could be immense. This research aims to assess the benefits of deploying EEE and create a power consumption model for network switches with and without EEE. Our measurements show that an EEE port runs at 12–15% of its total power when in low power mode. Therefore, the power savings can exceed 80% when there is no traffic. However, our measurements equally show that the power consumption of a single port represents less than 1% of the total power consumption of the switch. The base power consumed by the switch without any port is still significantly high and is not affected by EEE. Experiment results also show that the base power consumption of switches does not significantly increase with the size of the switches. Doubling the size of the switch between 24 and 48 ports increases power consumption by 35.39%. EEE has a greater effect on bigger switches, with a power (or energy) gain on the EEE-enabled 48-port switch compared to 2× EEE-enabled 24-port switch. On the other hand, it seems to be more energy-efficient to use 2 separate 24-port switches (NO EEE) than 2 separate 24-port switches (With EEE). This work was supported by the Erasmus Mundus PERCCOM programme .